An integrated-systems approach to factory automation promises much, but also opens the industrial environment to challenges already familiar in the IT space. Analog Devices explains. The technologies that comprise what has come to be known as “Industry (or ‘Industrie’) 4.0” have been the subject of much attention – almost as much, it might be said, as that other overworked expression, “Internet of Things”. Unlike some previous “buzz-word” topics, however, this is not a futuristic, months- or years-away matter but is happening “for real” at impressive, and accelerating, speed. Factory owners and managers are being driven in this direction by several distinct forces. There is the ever-present demand to increase efficiency and productivity, and set against that is the realisation that the era of low-cost, labour-intensive, offshore (from the Western perspective) manufacturing is drawing to a close. This should not have come as a surprise; in societies that have been industrialising at a faster rate than ever before seen, the personal aspirations of those workforces were sure to follow the same trajectory. Willingness to perform repetitive tasks for low rates of reward quickly disappears. At the same time, the – most welcome – increase in prosperity drives demand for manufactured goods, and for more product versions specific to new markets. Increasing levels of automation are essential, to meet demands for manufactured goods from established and emerging markets: at the same time, available technologies make feasible an entirely new level of automation, compared to what has gone before. Industry 4.0 promises agile production that delivers greater output, flexible manufacturing that can seamlessly build different product variants without interrupting operations, safe co-working between skilled human operators and tireless robotics (“cobots”), fully instrumented facilities that are immune to shutdowns due to unexpected machine failures, and much more. The most agile factory equipment manufacturers will thrive in this fast-changing environment, as they develop increasingly connected and intelligent systems which help factories to become more flexible and safer while maintaining security as they extend connectivity. Semiconductor technology is at the heart of this new generation of industrial automation equipment, providing the processing, control and sensing functions required to operate effectively in connected environments. Semiconductors provide affordable MEMS devices that make pervasive sensing possible and the connectivity that makes the totally-connected factory a reality. They provide the interfaces between the real and the electronic, the analog and the digital domains, and the processing power to make sense, in real time, of the torrents of data thus gathered. 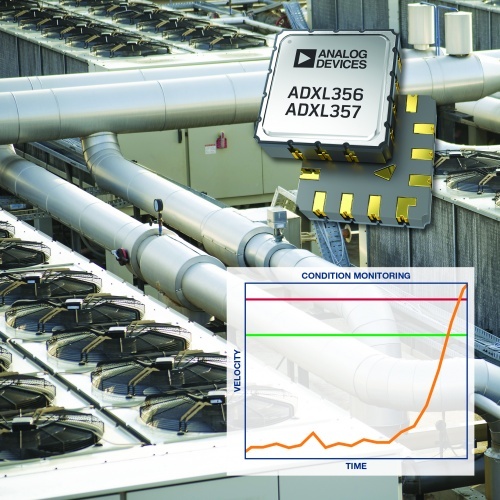 Analog Devices (ADI), which has always thrived at the intersection of the analogue and digital worlds, has a close-up view of the technology changes that new factory automation equipment calls for. Its expertise in the fields of sensing, signal conditioning, digital signal processing, wired and wireless connectivity and software exactly match the challenges that its industrial customers face, enabling it to develop application-oriented solutions that help customers innovate through technology while offering the guaranteed long-term availability of parts vital for the industrial marketplace. There is now more potential than ever for rich new applications of data analytics, such as machine health monitoring and preventive maintenance (see these links on applying MEMS devices, and on Condition Monitoring). At the same time, the increasing use of programmable hardware and software-defined electronics functions enables rapid reconfigurations of factory processes and tools. (Figure B) So which technologies in the analogue and digital semiconductor worlds are going to enable this new model of factory automation? MEMS sensor technology is enabling the development of new sensor types that are small, robust, able to precisely measure vibration and motion – and deployable in large numbers. For instance, low-noise, wide-bandwidth accelerometers offer the high precision and accuracy required to identify subtle changes in the vibration signature of a machine. (Figure C) Coupled with sensor analytics software, these devices enable equipment operators to pinpoint the source of a potential failure long before it occurs, and to apply preventive maintenance measures in good time. 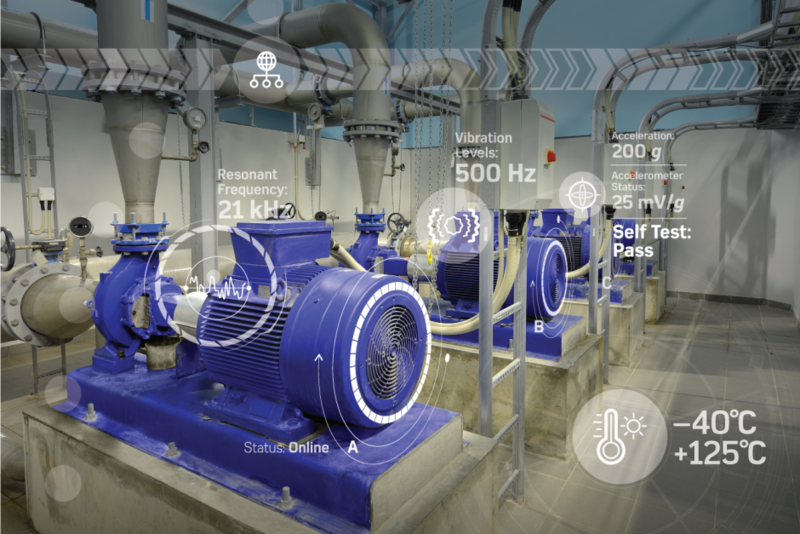 Sometimes termed condition monitoring, the concept is not itself new, but as with many other aspects of Industry 4.0, mass deployment and universal connectivity open up entirely new ways of working. The proliferation of sensors throughout factories and process plants is generating vast flows of real-time data. Legacy communication protocols between sensor nodes and PLCs, such as 4-20mA control loops, are giving way to ultra-fast industrial variants of the Ethernet protocol, enabling increasing integration of Operational Technology (OT) infrastructure in the factory with Information Technology (IT) in the enterprise. 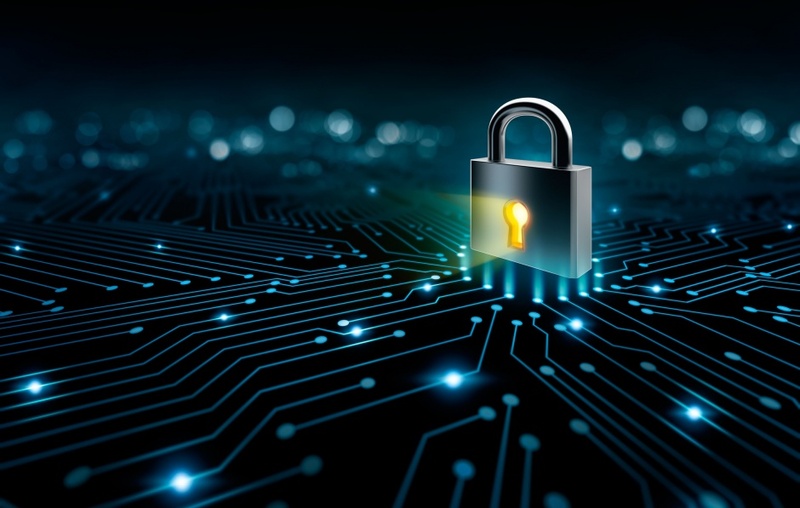 With connectivity comes the need to ensure that the future factory’s networks are secure against attack – see panel “Cyber security….” and this link on trends in industrial Ethernet. OEMs need to future-proof their system implementations, so that they support not only industrial Ethernet protocols in use today, but also the emerging Time-Sensitive Networking (TSN) Ethernet standard, which is likely to become the standard wired networking technology for real-time industrial communications. (This video clip outlines the operation of TSN. )ADI provides a solution that supports multiple Ethernet protocols without the need for hardware re-design. The factory of the future must be capable of quick adaptation to new demands and new workflows. The key is to build flexibility into industrial automation technology products at the architecture level. One approach which can support this need for flexibility is ‘software-defined I/O’ which can be configured as analogue or digital, and input or output, without altering wiring. The development and production of industrial automation equipment is becoming an increasingly high-tech undertaking, with the every-present pressure to get to market quickly with new, more sophisticated designs. Analog Devices’ response is to provide customers with an integrated offering, providing market-oriented solutions for applications including, among others, machine health monitoring, high-speed connectivity, safety and security systems. It will do so by combining analogue, mixed-signal and digital components with firmware and software, enabling automation systems makers to respond rapidly and effectively to the intensifying technological and economic challenges of today and tomorrow. Cyber security concerns in industrial control systems (ICS) have the potential to delay the adoption of Industry 4.0. The factory becomes a complex networked system, with Internet connectivity, and acquires all the vulnerabilities that can afflict any such system: hacking, data and intellectual property theft, ransom attacks… the list is familiar. Traditionally, factory automation systems have relied for protection on isolation – essentially stand-alone configurations with no, or very limited, interfaces to external IT systems or the Internet, where traffic can be monitored. Industry 4.0 is all about connectivity – throughout the manufacturing chain, and outwards to many layers of IT systems. This means increased access to the data to expand transparency, reduce network planning, lower CapEx, reduce OpEx, improve bandwidth, and optimize machine interworking. Isolation is not an option. Systems cannot be protected at their external interfaces (although that is required, also), they must be inherently secure. Traditional countermeasures applied to the system, such as firewalls and placing a device behind a locked door, are counterintuitive to the goals of Industry 4.0. When every sensor and actuator becomes part of an integrated and connected environment, data security must be built in to every node in the network to eliminate potential points of unauthorised access. The emerging automated factory also has distributed intelligence, with localised computing resources pre-processing data for transmission upwards in the hierarchy. Any and all of these become part of the potential “attack surface”. (Figure D) Appropriate solutions for every step of a design are readily available – secure processors, with secure-boot sequences and hardened operation, together with end-to-end encryption of all data and command paths, for example – but a strategic approach is required to ensure they become part of the “culture” of Industry 4.0. The engineers developing solutions for industrial control systems, have likely not seen significant cyber security requirements at the device level. A product lead working on devices in a factory might dismiss cyber security as an IT problem. However, the traditional methods for securing industrial control systems will no longer be sufficient in Industry 4.0. The challenges of ICS cyber security will ultimately delay the adoption of Industry 4.0, if companies do not have a strategy to address device security at the edge. In order to adopt and capitalize on Industry 4.0, cyber security needs to be a critical part of the business plan. Analog Devices recognises the challenges that Industry 4.0 is bringing to the market. ICS cyber security standards and guidelines are in place or being established to secure the factory, but they do not provide guidance on how to accelerate Industry 4.0 initiatives. With Internet Protocols (IP) extending to the edge, attack vectors increase as well the incentive to attack newly connected edge devices. Before, attacking an edge device had limited effect. With the extension of IP in the factory, previously benign devices open new attack vectors into more critical factory infrastructure. It is ADI’s mission to enable its customers to more rapidly adopt Industry 4.0 solutions by extending the secure edge and making it easier to implement security. Analog Devices is in a unique position to extend the secure edge, building on a traditional market space at the physical edge, where the real world is translated into digital signals and data is born. This gives us the opportunity to establish trust in data by providing identity and integrity much earlier in the signal chain and establish a new definition of the secure edge. Rather than being implemented at gateways, PLCs, or even servers, as in the industrial control systems security framework, the prospect of driving the secure edge lower in the signal chain is enticing because it enables higher confidence in the decisions that are being made from that data. The earlier identity and integrity can be established in the signal chain, more trust and confidence can be placed in the data that is driving decisions.